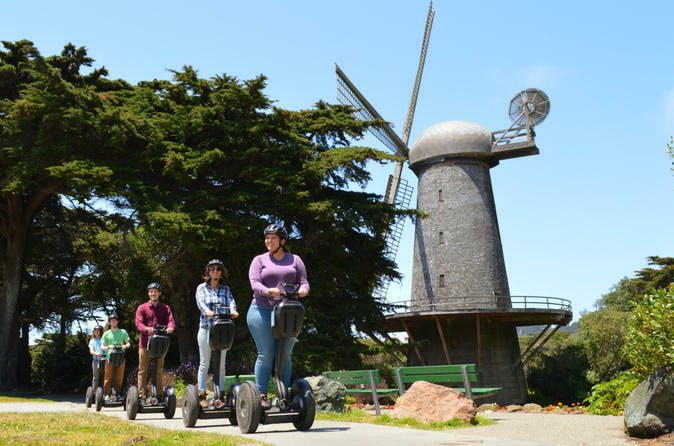 This Segway tour combines exploring Golden Gate Park with a visit to Ocean Beach! On this ten-mile, 3-hour tour exploration for all levels of Segway riders, guides share tidbits and trivia about the park’s 150-year history and show you what makes the park unique. Seeing Golden Gate Park and Ocean Beach is unforgettable on a Segway! Roll by the Fly Casting Ponds and get up close to the Dutch and Murphy Windmills. Enjoy the full spectrum of nature, from the Queen Wilhelmina Tulip Gardens to the bison paddock and horse stables. Pause and breathe in the tranquility of the Japanese Tea Gardens. Just before you get to the ocean, you’ll stop at the Beach Chalet, home to beautiful murals, some charming Golden Gate Park historical relics, and great food. Along the way, your guide will reveal hidden gems throughout Golden Gate Park that you might miss on any other mode of transportation. This tour is limited to eight riders per guide with narration via radio receiver with an earbud. San Francisco's newest Segway tour combines more exploration of Golden Gate Park with a visit to Ocean Beach! On this ten-mile, three-hour tour, guides share tidbits and trivia about the park’s 150-year history and show you what makes the park unique. There are many ways to see Golden Gate Park but you haven’t lived until you’ve seen it on a Segway. This tour makes use of walking paths and bike trails to present the beauty of the park. Because you travel in a group, you can slow down to check out the sights without disrupting traffic or feeling like you need to rush. Roll by the Fly Casting Ponds and get up close to the Dutch and Murphy Windmills. Enjoy the full spectrum of nature, from the Queen Wilhelmina Tulip Gardens to the bison paddock and horse stables. Pause and breathe in the tranquility of the Japanese Tea Gardens. Observe the Music Concourse and Temple of Music including the California Academy of Sciences and the deYoung Museum. Don’t miss the site of the California Midwinter International Exposition of 1894. Just before you get to the ocean, you’ll stop at the Beach Chalet, home to beautiful murals, some charming Golden Gate Park historical relics. Along the way, your guide will reveal hidden gems throughout Golden Gate Park that you might miss on any other mode of transportation. Once a desolate swath of sand dunes and nothingness, William Hammond Hill and his assistant John McLaren began plans in 1870 to transform the land into the lush, vibrant park that exists today. Your tour guides will regale you with entertaining tales of the park’s stewards over the years, and the uphill battles the grounds faced to get it to its current state. This tour leads small groups of no more than eight riders per guide to ensure a personal experience. To ensure you don’t miss any part of the narration, each guest gets a radio receiver with an earbud. The company even offers jackets, hats, and gloves to keep you warm and snug on those chilly San Francisco days. As you head out west toward the beach, you may encounter more of the city’s famous fog, so you’ll definitely appreciate the warmth as well as the experienced navigation! San Francisco Electric Tour Company is the exclusive licensed Segway tour operator in Golden Gate Park. There are a limited number of walk-up tickets available, and most tours sell out. Reservations are strongly encouraged.